The Solomon R. Guggenheim Museum (often referred to as "The Guggenheim") is a well-known art museum on the Upper East Side of Manhattan in New York City. It has a large collection of Impressionist, Post-Impressionist, early Modern and contemporary art. It also has several special exhibitions during each year. The museum was started by the Solomon R. Guggenheim Foundation in 1939 as the Museum of Non-Objective Painting, under the guidance of its first director, the artist Hilla von Rebay. 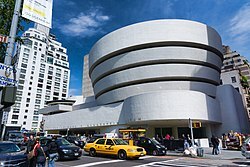 The name was changed to honor the founder, Solomon R. Guggenheim, after his death in 1952. Designed by Frank Lloyd Wright, the cylindrical museum building is wider at the top than the bottom. He wanted it to be a "temple of the spirit". The building is one of the 20th century's most important architectural landmarks. The building opened on October 21, 1959, replacing rented spaces used by the museum since 1939. To design the museum, Wright created more than 700 sketches until the final draft of the project was official. Wright spent 16 years working on the design, but he died before the building was completed. His design created a lot of arguments as many people did not like it. One person said it looked like "an indigestible hot cross bun", and another said it looked like "an inverted oatmeal dish." Some artists thought that the curved walls and ramps would make it impossible to hang their paintings properly. ↑ 1.0 1.1 1.2 Huguenin, Patrick (21 October 2009). "Guggenheim Museum turns 50: Here's 50 facts about New York institution". nydailynews.com. Retrieved 28 December 2013. ↑ Lubow, Arthur (June 2009). "The Triumph of Frank Lloyd Wright". Smithsonian Magazine. Retrieved 28 December 2013. This page was last changed on 26 July 2018, at 04:27.